Dr. Nguyen is a Diplomate of the American Board of Foot and Ankle Surgery. She is an investigator at Chesapeake Research Group, LLC, in multiple research studies, which focus on the safety, efficacy and tolerability of medications and devices that are designed to treat many different types of pain (acute, chronic and neuropathic), infections and systemic podiatric conditions. She is also an active member of the Maryland Podiatric Medical Association, and The American Diabetes Association. 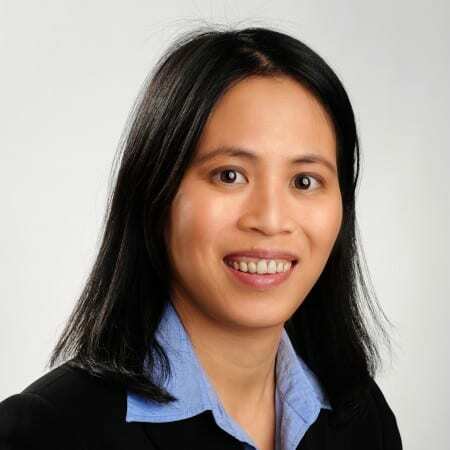 Dr. Nguyen’s special interests include sports medicine, diabetic wound care and reconstructive foot and ankle surgery. She is currently on staff at Baltimore Washington Medical Center. Dr. Nguyen participates in several local community health fairs year-round, to help educate the public about foot and ankle illnesses. She is fluent in both English and Vietnamese. She resides in Glenelg, MD, with her husband and their son and daughter. For leisure, besides enjoying time with her family, she loves nature and gardening. Doctorate in Podiatric Medicine, Temple University School of Podiatric Medicine, PA, 2003. Completed her three years of comprehensive residency training in podiatric medicine and foot and ankle surgery at Cooper University Hospital in Camden, New Jersey in 2006. She served as chief resident in her last year of residency at Cooper University Hospital. [Dr. Nguyen] is awesome!. Always kind, caring, & professional! I was having significant discomfort, and was able to get an appointment the same day I contacted the office. I was seen quickly, and Dr. Nguyen was friendly, professional, and thorough. Her explanations were clear and the treatment was very effective. I'm very grateful for such a high quality of care. [...] I was referred there 3 years ago by a Co-Worker, who Dr. Nguyen had operated on her foot. After having my appointment with Dr. Nguyen then, I was very thankful to my Co-Worker who had referred me to her. . [...] Dr. Nguyen performed a procedure on my toe, and today,[...] I saw her for a follow-up appointment. [...] I would absolutely recommend the practice most highly to anyone in need of quality, compassionate foot care. It would be my pleasure to do that. I was satisfied with the care that I received for my foot and ankle. Dr. Jenny explained my injury very thoroughly which made me understand what the problem was with my foot. I would recommend her to anyone who I know that is experiencing foot problems. The overall care and service that I received was an A+. All the staff members were pleasant and professional. [...]I was blown away by the kindness and comfort of each and everyone of your staff. Brittany was so help in calming my fears to see another foot specialist after some horrible previous experiences at other practices that shall remain nameless. When I met Dr G, he was very professional and informative, and eager to help relieve my ingrown toenail pain. I had to decline that first appointment to remove it then due to work reasons. I was told about Dr. Nguyen. Who’s bedside manner and patient relations stood out amongst her peers as stellar. I chose to come in during a work break in hopes to return to work, a lot due to the advice and assurance of Brittany. The procedure was uncomfortable but by no means painful. I so wish I’d of came here with my other toe first, I think the experience was easy, quick and allowed me to return to work the remainder of the day. I’d recommend the whole team at Pasadena, Foot and Ankle Specialist. The doctor really help me with my foot pain. Dr. Jenny Nguyen is very caring and gives helpful information about the care of my feet. The staff is amazing, and made me feel extremely comfortable. I love this office and the doctor that I see. She is very caring. She always returns my calls in a timely manner. Her MA is also kind. I enjoyed how the doctor is interested in my pain and what might be going on. She was very considerate and thoroughly explained the procedure. She put me at ease by her professionalism and knowledge. Dr. Nguyen was very thorough and took the time to go over my xrays in great detail. Mike (nurse tech?) was great, too! Dr Jenny is a wonderful doctor!